Minnesota is not known as being a prime location to grow tomatoes. The soil takes a long time to warm up in the spring, and the growing season is often too short to grow tomatoes from seed in the garden. However, Minnesota gardeners can still grow enough tomatoes to eat fresh and to make into sauce or freeze for later use. Provide your tomatoes with good care and work around your local frost dates as best you can. Choose tomatoes that mature early in the season. Tomatoes with smaller fruit tend to mature more quickly than larger fruited tomatoes. Early Girl, Sungold, Mountain Princess and Tigerella are some early varieties. Start tomato seeds indoors five to six weeks before the last predicted frost in the spring. Sow the seeds according to the instructions on the envelope and keep in a warm, sunny location until transplanting. You may also buy tomato starts at garden centers later in the spring. Harden off tomato transplants by placing them outside for an increasing amount of time every day until they are accustomed to life outdoors. Plant tomatoes outside after the danger of frost has passed. In southern Minnesota, this is early to mid-May, while northern Minnesota is not reliably frost-free until the first week of June. Plant the tomatoes in rich, well-drained soil in a location that receives full sun all day. Train tomatoes to grow on stakes or in a wire cage. This keeps the fruit off the ground and helps prevent disease. Lay down 3 to 4 inches of mulch around the base of your tomato plants. This will help keep down weeds and will also regulate the moisture and temperature of the soil. 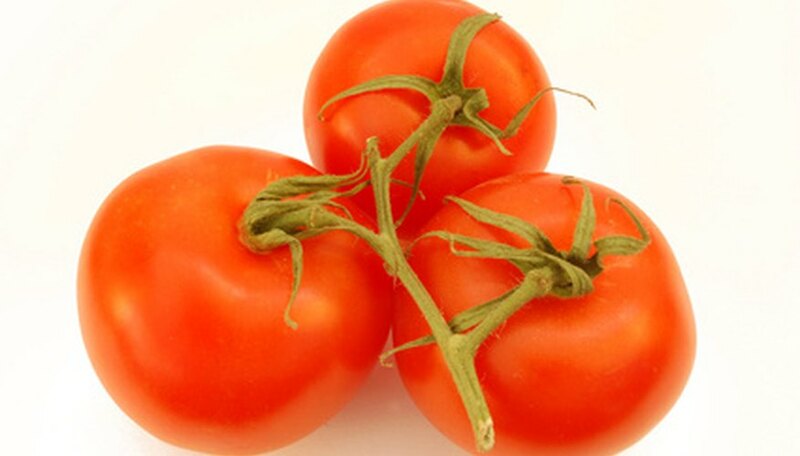 Water tomatoes deeply and regularly so that they receive 1 inch of water every week. Using a soaker hose instead of a sprinkler gets the water to the roots more efficiently. Splashing water from an overhead sprinkler may spread disease. Cover tomato plants with an old sheet or tarp at night in the fall if an early light frost is predicted. The sheet or tarp will help retain heat and protect the plant. Remove the covering early the next morning so that the plant doesn't warm up too quickly and burn when the sun comes up. Covering plants at night may help lengthen the growing season by a few weeks. Pick all green fruit before a predicted hard freeze. You can ripen green tomatoes indoors on a sunny windowsill.